This month’s issue is all about the Ivy League! 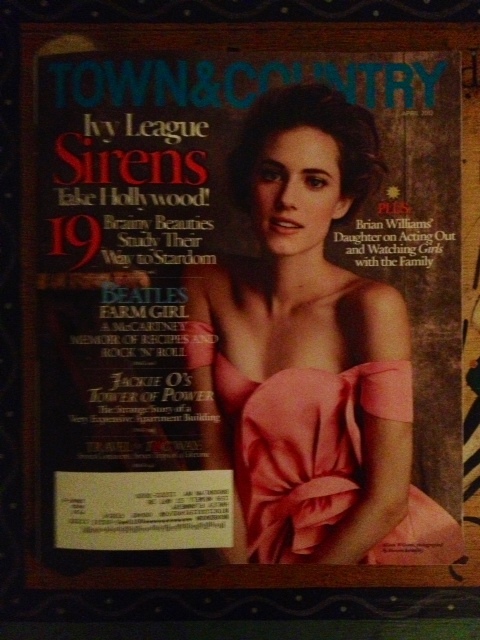 Cover girl Allison Williams – whose name isn’t even mentioned on the cover, she’s just “Brian Williams’ Daughter” – went to Yale. And 19 other “Brainy Beauties” are apparently “Taking Hollywood By Storm”. I was hoping for some juicier details about America’s most celebrated institutions of higher learning but was sorely disappointed, as the coverage of Ivy League schools is limited to an Editor’s Letter about the summer he spent at Yale while he was in high school, a profile on Allison Williams, and a two-page spread on already established actresses who only needed to attend a couple of years at an Ivy League college in order to be included in their roundup. Jay Fielden, the EIC of Town & Country, spent the summer of 1987 at Yale, living in Silliman College and taking two classes (in American Studies and the religions of Africa, he tells us). It seems from his letter that what he really got out of this summer, aside from an appreciation of WASP culture, was a lasting love for reggae and “Bud in a can”. Also, hacky sack. Apparently, he spent many an evening “in pursuit of ‘a nice hack’”. (OMGOMGOMG). Also, no mention of where he went to school but The New York Times is telling me it was Boston University. – On the night of the Golden Globes, “she giddily snapped photos of her self with the actor who plays Abu Nazir on Homeland”. – She “cops to occasionally veering into Tracy Flick territory”. – According to the author of the profile, she had a “Rockwellian childhood”. – She met her best friend while “vacationing at a Montana dude ranch” as a child. – “She gave up drinking after college”. SHE GAVE UP DRINKING AFTER COLLEGE. – Style icon: Grace Kelly. There is no other choice. Everyone who you already knew went to an Ivy League school. (Except I guess I didn’t know Amanda Peete went to Columbia, but you learn something new every day.) Also, I would argue that most of them have already taken Hollywood by storm, though not all of them have remained in the spotlight. What I’m saying is, I’d really like a Leelee Sobieski profile next month. A man from Lexington, KY wrote a letter to the editor to complain that Jack Kennedy Schlossberg, “the only living male heir to Camelot”, was not included in “T&C’s 50 Top Bachelors” back in February. The Editors apologized. Two-thirds of a page is devoted to the recent trend of rich people literally purchasing entire medieval towns. “When one visits Marissa Collections in Naples, Florida, it’s hard not to think of the Cheers bar in Boston (or at least in syndication). True, there might not have been Lanvin dresses and Alexander McQueen clutches in Sam Malone’s saloon, but both places serve as gather spots for the like-minded.” I think this is a stretch. “There are endless choices involved in embarking on a day by the sea: suntan oil or lotion, book or tablet, caftan or cutoffs. And now, Valentino espadrille or Chanel jelly.” Suntan lotion, book, caftan. And like 10 year-old flip flops. And a guide to fancy English umbrellas! Complete with three pictures of Prince Charles! Several photos of Charlotte Casiraghi (above) competing in an equestrian competition dressed as a Native American. Two people called Halsey and Griffin got married. And here is the part where I admit that I read their wedding announcement in The New York Times this summer. There’s a piece on Aristotle Onassis’s Olympic Tower that the cover referred to as “Jackie O’s Tower of Power”, of course. It includes a photo subtitled: “‘70s Primitivism: Helene Rochas reclines in the shade of her luxuriant and well-tended kentia palms, 1979.” And that is all you need to know about THAT. Mary McCartney wrote a thing on her mother’s cooking and how the entire McCartney clan is vegetarian. The McCartneys seem nice/very down to Earth. T&C urges us to travel to the following places abroad: Antarctica (six different proposed “adventures”, depending on your personality), Walt Disney World (but you should only stay at the Waldorf Astoria or Four Seasons), the Republic of Congo, Mani (the region of Greece where my actual hero Patrick Leigh Fermor* lived for much of his life), and Portillo (“the other Aspen”, in Chile). Also, Qatar (to dive for pearls) and Tasmania. There’s also an American travel guide, divided up by the following pursuits (and from there, by skill level): golf, camping, and sailing. That said, it’s time for us to sail away from T&C until next month. If you need to reach me before then, I’ll be tending to my topiaries. *I’ve talked about his books A Time of Gifts and Between the Woods and the Water, here and here. Read them! They are beautiful, beautiful portraits of Europe just before WWII that are full of incredible and mostly obscure history and plain old fun facts. And the writing isn’t bad either. through Google, and found that it’s truly informative. I am gonna watch out for brussels. I will appreciate if you continue this in future. Many people will be benefited from your writing. Cheers! I’ve read several just right stuff here. Certainly worth bookmarking for revisiting. I wonder how much attempt you place to make one of these wonderful informative website. You did not indicate how cold taeeerpturms will drop at night. I sleep overnight at zero degrees quite frequently. A tent retains some body heat. A zero-degree sleeping bag like the Marmot Never Summer, $ 300, helps retain heat. An insulated heating pad, such as the Big Agnes Dual Core, $ 110, helps retain heat and separate your body from the frozen ground beneath your tent. Boiling a few liters of water for Nalgene bottles to put inside your sleeping bag helps add heat. Eating a hot meal generates heat. Since three in the morning is usually the coldest temperature of a night, drinking a bottle filled with hot chocolate helps create heat.